This 10 day tour can be customized with the number of walking days of your choice, number of rest days of your choice, the hotels are carefully selected on the Camino. 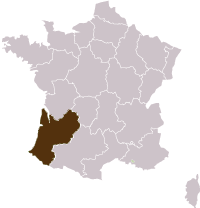 The section between Aire-sur-Adour and Saint Jean Pied de Port winds its way through 2 distinct regions: the Bearn and the Basque Country. The walk first crosses the green wooded hilly landscape between Aire and Navarrenx and then climbs up through the white Basque villages to Saint Jean Pied de Port.The Pyrenees range, in the backdrop,is each day closer while approaching Ostabat which is the converging point of 3 Routes on the St James Way.The Sauvelade Abbey,the Navarrenx Bastide, Saint Palais are famous remarkable places. 2 and 3 star hotels and Guest Houses (depending upon availability). Private bathrooms Half board from dinner day 1 to breakfast day 9. Dinners and breakfasts are in your accommodation and can be "table d'hotes" with other guests. A road book for 2 persons with the description of your program and full detailed walks with a walking map. The transport of your luggage from hotel to hotel. The trip to the start of the trip and from its end. All lunches. Visits. Drinks. Travel insurance. Everything else that is not listed under "Price includes".